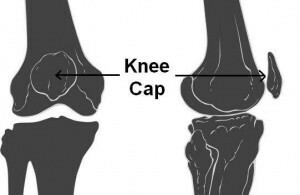 What is knee cap pain? Knee cap or patella is a triangular rounded bone present in front of the knee. It is formed because of friction between the quadriceps (muscle group on front of thigh, which helps in knee straightening or extension) tendon and the knee joint. Such a bone is called a sesamoid bone and patella is the largest sesamoid bone of the body. The mere presence of patella leads to an increase in the mechanical advantage of knee extension. As the bone glides over the knee joint during movement, a dynamic stability is added to the knee joint and the direction of pull from the thigh muscles is constantly maintained. Hence, we have tremendous control over our body during knee straightening. This helps us to stand, sit, and perform kicking movements (like playing soccer) with precise control and the ability to voluntarily stop the movement and sustain the position at any point. Thus, the knee cap is indispensable for an accurate functioning of the knee joint for various activities. Knee cap pain is specifically related to diseases of the patella and the patellar ligament (also called patellar tendon), which attaches it to the leg bone tibia. Patella fracture, dislocation, or ligament injury are generally due to a fall on the knee, with direct impact on the knee cap. Degenerative conditions like chondromalacia, bursitis, and so on, are common delayed consequences of repetitive knee strain especially seen in athletes. Knee cap pain from traumatic conditions gives rise to sharp pain during knee movement which is relieved by keeping the knee fully extended or straight. Knee cap pain from degenerative conditions is typically felt during prolonged sitting, like for a movie. Hence, this type of pain is called movie sign or theater sign. This occurs because of the constant pull of the quadriceps muscle on the knee cap while sitting, which causes its impaction against the hard and unyielding surfaces of the bones of knee joint. Knee cap pain can arise from injuries as well as degenerative diseases. Knee cap injury is discussed separately. Degenerative diseases of the knee cap like chondromalacia patellae or patellar tendinopathy are the end result of persistent stress on the knee joint. Hence, these diseases are commonly seen in athletes as well as manual laborers. Chondromalacia patellae is softening of the cartilage on the under surface of the patella or knee cap. It is frequently seen in young athletes and so is also called runner’s knee. It occurs due to an abnormality in the gliding movement between the knee cap and the lower end of thigh bone or femur, which is called as patellar maltracking. 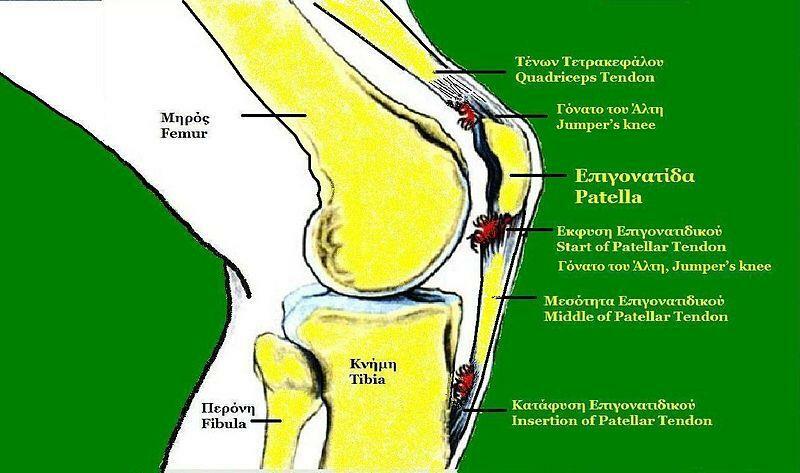 Hence, it is also named as patello-femoral syndrome. This leads to irritation of the under surface of patella, every time the knee bends and straightens. Athletic activity results in frequent irritation, leading to inflammation of the cartilage of patella. This causes cells of the immune system to concentrate in the cartilage. Thus, inflammatory activity in the patellar cartilage causes its softening, and progresses towards erosion of the cartilage. Thinning of cartilage exposes bone tissue on the under surface of the patella. Cartilage does not have blood or nerve supply and so is pain insensitive, but bone is not. 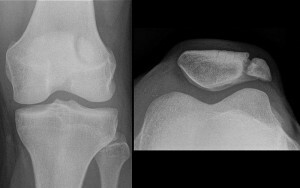 Hence, the frictional irritation of patellar bone tissue during knee movement causes knee cap pain in chondromalacia patellae. Treatment of chondromalacia patellae involves avoidance of the factors causing irritation of the cartilage of the knee cap. Use of supportive knee orthosis or patellar centering devices along with analgesics and ice packs help to improve knee function. Selective muscle strengthening helps to reverse patellar maltracking and prevents further damage to the cartilage. The already damaged cartilage is known to shed small pieces into the joint space, causing episodic locking of the joint. Ideally, the damaged cartilage should be surgically removed from the knee cap. Arthroscopic removal of this cartilage is highly advantageous and prevents damage to other structures of the knee during surgery. Patellar tendinopathy or patellar tendonitis (Picture 1) is a process in which the patellar tendon undergoes micro tears from the repetitive strain. This type of degeneration is also seen in the arm and is called supraspinatus tendinopathy. The patellar tendon is strong and connects the patella to the shin bone tibia. The entire contracting force of the quadriceps muscle of the thigh converges on the knee cap and is then passed on to the patellar tendon during knee straightening. This stress is multiplied by several times during activities like jumping, which is a common cause of this disease. Hence, it is also called jumper’s knee. The mild form of tendinopathy results in pain only after the strain causing activity. Severe forms result in pain during activity or even before performing the activity. This can adversely affect the performance of an athlete, and so should not be ignored, as a delay in treatment further increases the time required for complete recovery. Treatment consists of analgesics and ice packs to be used when pain occurs. Physical therapy with strengthening of calf muscles helps in reducing the burden of weight bearing from the patellar tendon. Aprotinin injections, though once popular, are now under re-evaluation regarding reports of alleged allergic reactions. However, injectable therapy using irritant substances, called prolotherapy or needling (Picture 2) is gaining significant importance in the treatment of such disorders. Surgical treatment has no distinct advantage over the above, but is important for longstanding disease. 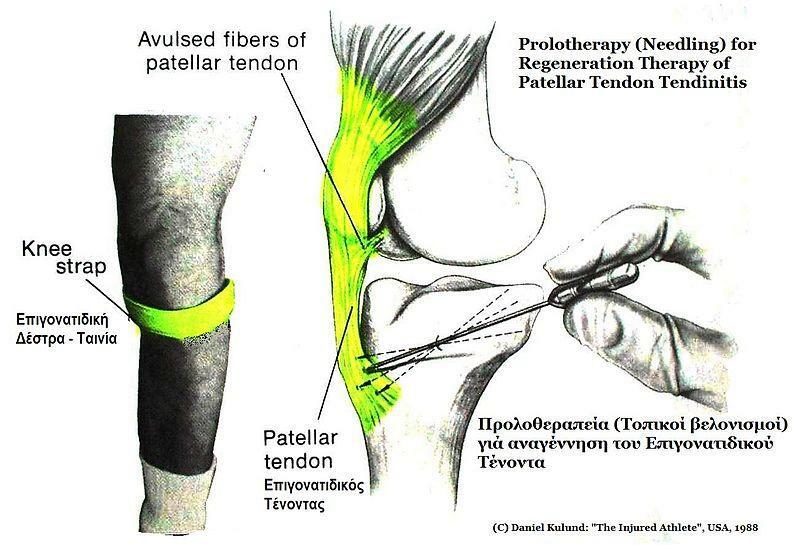 It changes the region of the tendon bearing maximal weight by release of a few fibers from the sides of the tendon. However, it has to be followed by a rehabilitation program with aggressive physical therapy to prevent recurrence and reestablish knee functions. Knee cap injury is generally the result of a tripping fall while walking. The sudden loss of balance unlocks the knee from the straight position. Thus, while falling the knee cap is the first to strike the ground. The knee cap can also be injured by the impact of the dashboard of a car during a vehicular accident. Other than this certain sports also result in knee cap injuries if adequate protective gear is not worn. Knee cap injuries cause severe pain (knee cap pain), especially during bending of the knee for activities like walking or squatting. It is quite surprising how injury to such a small bone can cause so much disability ! 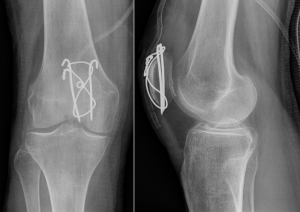 Patella fracture or broken knee cap (Picture 1) can be simple or complex depending on the resulting pieces of the bone. A simple patella fracture is generally with 2 or 3 parts, which remain close to each other. This can be treated with a plaster cast from thigh to the ankle with the knee in extension or straight. Since the pieces are not displaced the fracture heals in 4-6 weeks. Sometimes, if the pieces of bone are displaced far apart from each other, it is treated by surgically holding the pieces of bones together using a steel wire. This is called tension band wiring (Picture 2). 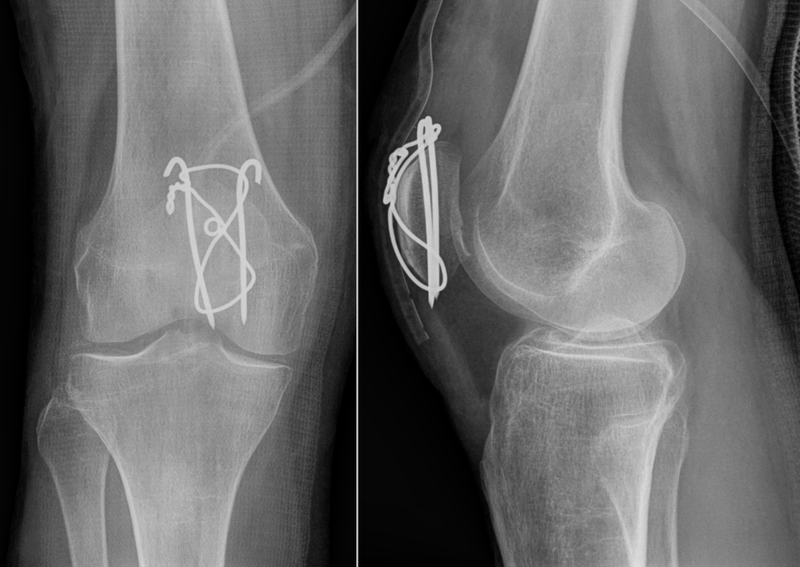 A complex patella fracture is when the knee cap breaks into several small pieces, which cannot be reconstituted surgically. In this case, the pieces of broken patella have to be surgically removed from the body. This surgery is called patellectomy, and is associated with weakness during kicking movement called as extensor lag. Patella dislocation occurs due to a sideways force on the knee cap, which breaks the restricting ligaments of patella and displace it sideways. The reflex forceful contraction of the quadriceps muscle locks it in this position and prevents it from coming back to its normal position. This is a highly painful condition and has to be treated immediately. A delay in treatment causes accumulation of blood in the knee joint, with resulting destruction in knee joint soft tissues (cartilage and ligaments) and restriction of knee movements. Even after the knee cap is brought in the normal position, the leg has to be kept in a plaster cast from thigh to ankle with the knee straight. This helps in healing of the injured ligaments and prevention of further episodes of knee dislocation. If this is not done the knee cap remains vulnerable to unrestricted and haphazard movement (patellar maltracking), which leads to recurrent dislocations and later degenerative disease of the patella like chondromalacia patellae or runner’s knee. An orthopedic surgeon trained in JJ Group of Hospitals and Grant Medical College. I have worked in this field for the past 3 years and have significant clinical experience to guide students and patients on any topic in orthopedics.